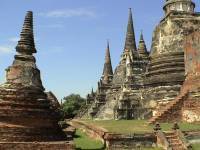 Bangkok, Ayutthaya, River Kwai raft hotel and a relaxing week on the beach at Hua Hin! 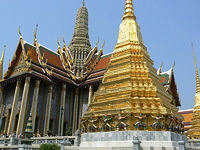 At Bangkok, our Bangkok representative will be at the airport to welcome you & transfer you to your hotel. The rest of the day is at leisure for resting, shopping or relaxing by the hotel pool. Today, our city tour of Bangkok includes The Grand Palace, Funeral Hall, Wat Pra Kaew, Wat Traimit, Wat Pho, Wat Benchamabopit & the Temple of Dawn plus a canal tour on a private boat. After dinner at a riverside restaurant, we take an evening trip to see the night market. After breakfast we set out for the ancient capital of Siam, Ayutthaya, where we visit the historical ruins & four main Buddist temples. Lunch at a local restaurant. Overnight in Ayutthaya. 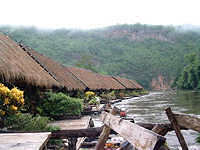 Leaving the River Kwai area, we drive to Amphawa and check in at our hotel. After lunch, we take a tour of the local temples by boat. This morning we visit Amphawa's famous floating market, then drive on to the seaside resort of Hua Hin. Later that day, we visit Hua Hin's night market and outdoor dining street for dinner. 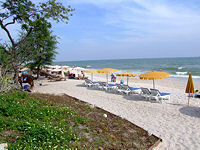 Drive back from Hua Hin to Bangkok for your return flight.